51 ACU Swan Regiment Drums & Pipes are a cadet pipe band based at Karrakatta in Perth. Since the 2016 St Andrew Society Ball, when they first played for us, the Society has been thoroughly entertained on a number of occasions by 51 ACU Drums & Pipes and in return we have made donations to the band from the proceeds of our raffles etc. The Drums & Pipes are made up mostly of younger cadets and are exactly the sort of group that the St Andrew Society was established to encourage and support. We look forward to maintaining an ongoing relationship. The St Andrew Society of WA are pleased to have donated the proceeds of the 2016 Chieftain's Ceilidh raffle to 'Soldier On', a most deserving cause with the role of "helping our wounder warriors". 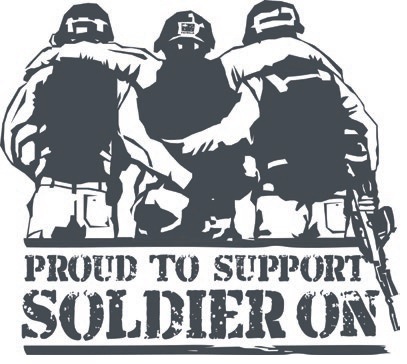 'Soldier On' supports those who have served, by focusing on their physical and mental health, as well as their community and their future. They have assisted thousands of servicemen and women as they have dealt with physical and psychological wounds resulting from their service. The St Andrew Society of WA are pleased to be able to provide some support to 'West Australian Police Legacy' this year (2016), with a financial donation. Police Legacy is a charitable organisation that was established in 1992 to provide support and welfare to police officers families that need assistance and support when they lose a loved one. There are currently 375 widows, 3 widowers and 43 children under 20 years of age being supported by WA Police Legacy and we consider this to be a cause worthy of our support. The Saint Andrew Society of Western Australia (SASWA) is proud to have provided sponsorship to the young men and women of 7 Wing, Australian Air Force Cadets. The Australian Air Force Cadets (AAFC) are the cadet arm of the Royal Australian Air Force. Formed in 1941, the AAFC involves young people from the ages of 13 to 20, in aviation and leadership training in a military environment. As well as flying, specific activities undertaken include rifle shooting, various bush-based activities, navigation, the operation of military radios, field craft, camping and survival techniques. If you are interested in knowing more about what the AAFC do, or wish to encourage someone you know to join, please follow the link to their website on our links page. The sponsorship that SASWA provided, known as "The Saint Andrew Society of Western Australia Engagement Scholarship", covered the cost of achieving solo flying status in a glider for a minimum of four young people every year during 2015 & 2016. In general terms, the scholarships were targeted at those young people who demonstrated an outstanding capacity in leadership, aviation skills and generally maintaining high standards in all that they undertook. The Society was keen to ensure the Scholarships were targeted to young people who met the criteria but may not otherwise have had the financial resources to achieve the desired flying time. As in most things, some Scottish blood was considered a bonus, but not essential! 7 Wing AAFC reciprocated by supporting the Society with their Drum Corp, in performing at some of our social functions.